We designed an outdoor living room for our backyard and this is the umbrella to provide shade during hot days. Mechanism and base are well made. Overall very happy. Stay away from the strong sun rays and keep cool in shades in your summer patio with this Valencia outdoor canopy umbrella by Havenside Home. 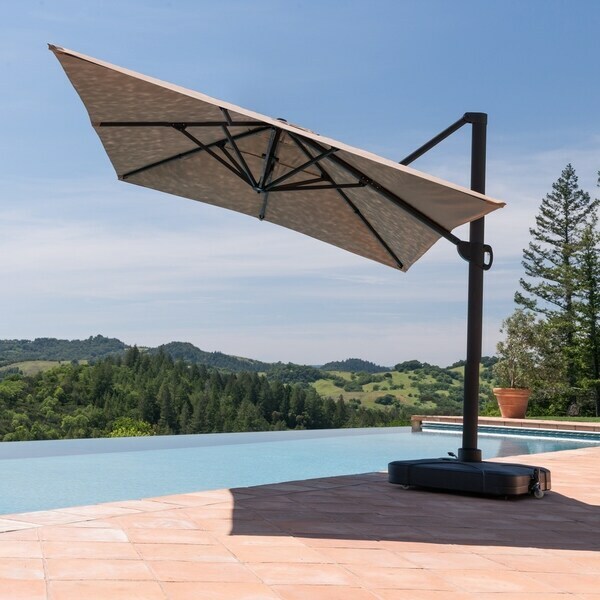 Featuring rust proof aluminum pole with an adjustable crank handle, the umbrella can be easily expanded and tilt into 7 positions to offer shades at any angle for your outside relaxation. The canopy is made of weather- and UV-resistant Sunbrella fabric to withstand the elements. The base features retractable wheels for convenient movement and can be filled with up to 300 pounds of sand and gravel to keep the umbrella securely in place. Beautiful piece to add to our collection. Especially after the matching one was no longer available. This is a very well crafted umbrella, It rotates 360 degrees, and tilts up/down. Its a rectangular shape wand very large. It provides a good amount of shade to my pool area. It has a pole which pushes down to raise the base and it moves around fairly easily, we have pavers, it gets stuck on them at times but If it was on a flat surface it would be smoother. Fairly easy to set up, 25-30 min, Came in 2 boxes. Great umbrella. Very sturdy and high quality. Fits my 9 x 15 deck perfectly and makes every seat at my patio dining set a good seat. Be aware, the base is pretty enormous. I’m trying to find a cement base that’s a bit smaller but because the shape of the pole is both large and irregular it has proven to be quite a challenge. All and all I love it though. This umbrella is superb! Not at all difficult to put together but very heavy and sturdy. The color of the fabric camel matchers our wicker furniture pillows perfectly! Has to be one of the best looking umbrellas I have ever purchased! Looking for a cover that will fit! My review is about overstock customer services and policies. I purchased this umbrella with what I thought was an early season sale, 2 weeks after my umbrella was delivered the price dropped more. I called Overstock to see if Ibcoukdcget a price adjustment. They told me no, even though I'm still within the 30 day return date. The price dropped over *** That's a large amount and thus is very bad cust. Service. Businesses that does take good customer service seriously don't deserve customers at all. If you Google Overstock customer service you will see A LOT of complaints. I will never shop here again!! Quality, color, price and hopefully, quick delivery. We have a very similar if not the same umbrella purchased in 2012 from Bed Bath and Beyond, fitted to our small deck. It has provided great shade and ease of attachment for eight years. Although it still works, we decided to buy this one as a backup. Our bay style doors and window arrangement didn't allow for a Sun setter installation, but this works well and stands up to substantial winds when tethered at each arm point with bungees. These are attached to eyelets on the railing and on the tops of two wind screens at each end of the deck. We face west and the sun heats up the house, so without these umbrellas to cover our rectangular deck, we'd be toast. We collapse and cover when not in use and store on shelf hooks in the garage in winter. The fabric has not broken down like other vinyl type products, so worth the money in our opinion. "How heavy does the concrete base need to be to hold it securely? Any specifications on a base I should know?" The umbrella base measures approximately 8.8 inches high x 37.4 inches wide x 37.4 inches deep. It can be filled up to 300 pounds of sand and gravel. "Can the pole be permanently secured in a concrete base?" Yes, the pole can be used in a concrete base. It is approximately 2.5 inches in diameter.